Although by the calendar we still have another week or so until it’s “officially” summer (4:51 a.m. Mountain Time on June 21), it sure feels like summer at Alta. The snow has melted from Cardiff Pass and the hillside is green. 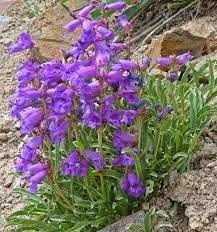 Purple penstemon flowers are on the south side of the seven turns section of the canyon road.The aspen trees are stunning, Little Cottonwood Creek is flowing with nearby waterfalls adding to the current. For hikers there are numerous trail options in Little Cottonwood Canyon, beginning with the Quarry Trail at the base of the canyon, a good hike for beginners. Further up the canyon at the White Pine Trailhead there are several hikes to lakes that gain quite a bit of elevation and offer spectacular views. The Hikes and Lakes web site provides information on different hikes in the canyon with photos and descriptions.